(Newser) – Former Israeli President Shimon Peres was in "serious but stable" condition after suffering a major stroke, doctors treating him said Wednesday, as the nation rallied in prayer and support for the 93-year-old elder statesman and Nobel Peace Prize laureate. Dr. Yitzhak Kreiss, director of the Sheba Medical Center near Tel Aviv, said Peres was in a medically induced coma to allow him to rest after experiencing significant bleeding in the brain, the AP reports. 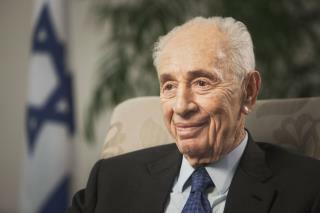 Peres was rushed to the hospital Tuesday after feeling ill, and following a battery of tests he was diagnosed with having suffered a stroke. Kreiss said Peres was being transferred to the neurosurgical intensive care unit. Israeli media reported Peres was "fighting for his life," but Rafi Walden, Peres' son-in-law and personal physician, said there appeared to be no imminent threat to his life anymore. Shimon Peres was way better leader than Bibi. Shimon, the eternal optimist, hope it helps him this time around.